this unspoiled paradise was a well-kept secret. Located on Jost Van Dyke, this bay is now regularly featured on top 10 Beautiful Beach lists and features white sands, turquoise waters, and rolling green hills. This beach is pretty much still un-developed and offers a glimpse into the Caribbean of old. Horseshoe Bay, Bermuda. What better way to add some color to your Christmas card than with the pink sands of Bermuda? 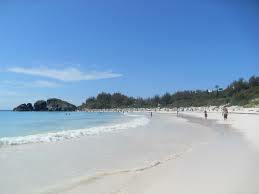 Horseshoe Bay is rated the #8 beach in the world by TripAdvisor. This popular and famous beach is located on the main island’s south coast. Since Bermuda’s a little north of the traditional Caribbean, you’ll want to snap your photos between May and October or your photo shoot might be a little chilly. 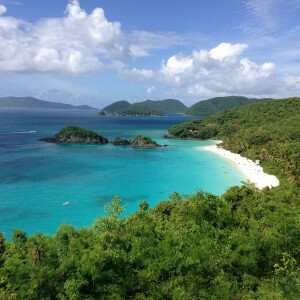 Trunk Bay, St. John. 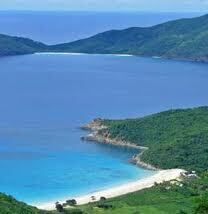 Consistently on Top 10 Beaches of the world lists, this national park is a treasure of the US Virgin Islands. In addition to stunning natural views like powdery white sand, coconut palms and sparkling crystal-clear water, this beach provides modern amenities (making touch-ups and clothing changes easier). You’ll be able to take that family photo and then quickly change into swimwear to enjoy the best of this beach. Virgin Gorda, British Virgin Islands. The thi rd-largest of the British Virgin Islands, Virgin Gorda is best known for an unusual geographic formation called“The Baths.” Found on the southern end of the island, this collection of boulders, saltwater pools and grottoes surrounded by white sands offers stunning scenery and locations for photo ops. Keep in mind, this location is often only accessible by foot and parts of it require trekking up and around rocky areas using rope handrails. 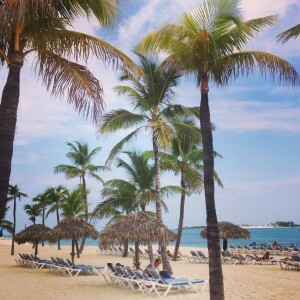 Nassau, Bahamas. The Bahamian capital offers plenty of photo shoot locations – including tons of beaches to choose from and the world famous Atlantis Resort.Since this island thrives on heavy cruise ship traffic, many local photographers offer photo packages designed for cruisers that allow you to get the best shot, but still enjoy your day on the island. You can take your own family photos (that’s what the self-timer’s for, right?) or arrange a professional photographer ahead of time. Taking your own photos saves money and with photo editing software, you can make it work really well for your Christmas cards. Hiring a professional photographer can be a little pricy, but it’s a great option to create and capture special memories of your trip. These are also great for your living room wall, not just your annual Christmas card. To find a local professional, try google searches and check out the online portfolios of the locals to see what style you like best for your family. In addition to a local photographer, cruise lines often offer the services of their professional photographers while in port. Do your research or check with your cruise line ahead of time to explore their options.